A wedding ring doesn't have to be plain or predictable, and there are many creative wedding rings couples can choose from for romantic, personalized bands to symbolize their commitment to one another. Click on the 'buy now' link at the bottom of any picture to find purchasing information. Many brides prefer diamond bands to accompany their engagement rings, but choosing a bezel set eternity ring is a great way to keep the sparkle of a diamond wedding band in a creative and elegant way. Adding a metal inset to a plain wide band is a great way to add creativity to a wedding ring. Carbon fiber lattices are popular and give the illusion of texture to the ring in a subtle yet stylish way. For a simpler look, couples can opt for contrasting metals to inset, such as an inset of yellow gold in a platinum wedding band for a two tone ring. If you want a touch of sparkle in your wedding band but want something different than a classic diamond band, consider a single offset diamond framed with brushed metal. This draws attention to the diamond without being overwhelming, and it is a perfect design for both men and women. Celtic wedding rings are popular, but instead of the common braided metal bands, consider an inlaid two tone design that has the Celtic knot pattern etched onto the surface. This gives the ring both traditional weight and cultural styling in a beautiful way, but be aware that the etching is more subject to wear and may become less visible over time if not treated properly. Add a burst of unusual color to your wedding ring by choosing a colorful inlay. Tungsten carbide and titanium rings are easily tinted in a range of colors, including blue, green, yellow, red, or pink, allowing couples to choose colorful rings that match their personalities. Metal detailing on your wedding band is a unique and creative way to give the ring more dimension. Swoops, cuts, and swooshes are popular stylistic elements that can give the illusion of two rings wound together - perfect symbolism for a marriage. A few diamonds in a flush setting will add extra sparkle. Mokume gane wedding rings are a fusion of different metals blended into fluid, organic patterns. True mokume gane may use different types and colors of gold as well as silver, bronze, copper, or steel, though similar patterns can be created with tungsten carbide as well, giving couples very creative wedding rings at an affordable price. Antique-inspired wedding rings are often more creative than modern classic bands. Scallops, multiple diamonds, etchings, and other details are woven together in an intricate style that is both delicate and romantic, and pairs perfectly with an antique, Victorian, or Edwardian engagement ring. Yellow and white gold may be the most popular options for many wedding rings, but more unique gold colors such as sage, rose, and chocolate give even classic ring designs a creative and unusual touch. 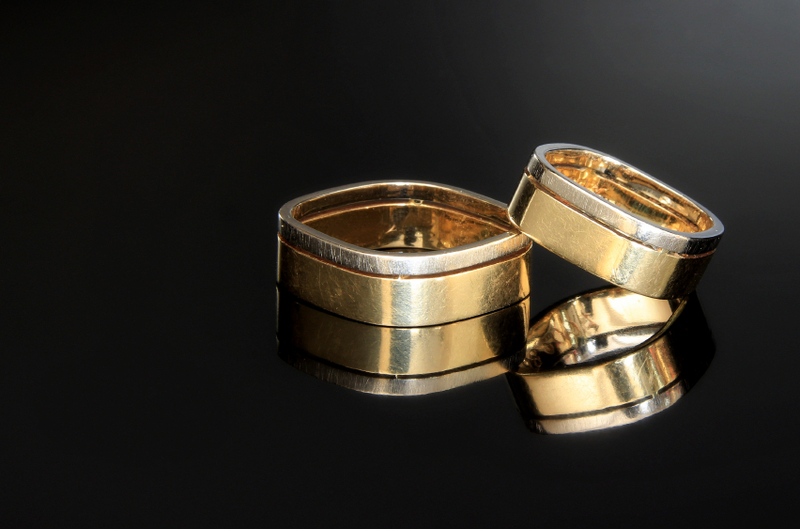 Couples can opt for rings crafted entirely from colored gold, or may choose a two tone ring with contrasting colors. Enamel filigree patterns add feminism and beauty to a plain wedding band and can be combined with pave set stones, scattered diamonds, or contrasting metals for even more distinction. Furthermore, enamel is inexpensive and can be a beautiful option for couples looking for cheap wedding rings. Inlaid rings using contrasting metals are the most common way to create two tone wedding rings, but there are many other materials that can be used for an inlay with a bit of creativity. Wood inlays have a rich, warm appearance, or cable or chain inlays add dramatic texture. Mother of pearl or opal inlays are also popular choices. A diamond wedding band can be beautiful, but gemstones in a straight line is also a predictable and common wedding ring choice. Instead, consider a slightly wider band with scatter set diamonds strewn across the surface for a more flirtatious, creative option. Bridal set engagement rings are popular, but instead of choosing a matching, coordinated set, consider contrasting metals instead. A yellow gold engagement ring is brilliant as the focal point of a white gold or platinum diamond ring wrap, for example, and the contrast makes the ring more distinctive and lovely. A wedding ring doesn't have to be made of metal. Some of the most creative rings are also simple, plain bands of other materials, including jade, quartz, agate, or wood. Many other semi precious gemstones can also be crafted into unique wedding rings.